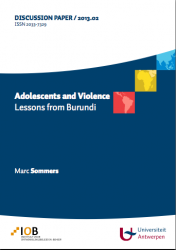 This research on the state of Burundian adolescents and the role of violence in their lives, undertaken in late 2012 by Marc Sommers, found a profusion of young Burundians threatened by deprivation and domestic and sexual violence. Most receive limited social and state protection and have difficulty remaining in school, finding work or settling into adulthood. In the countryside, strong cultural traditions and a weak state facilitate the mistreatment of orphans and girls who become unmarried mothers and in Bujumbura, many adolescents arrive alone and are vulnerable to exploitation.